YA Scavenger Hunt, Fall 2013 – Win! The contest is over! Winners will be announced soon. Thank you all for playing. Welcome to the YA Scavenger Hunt! You can read exclusive content from YA authors and also win big prizes. Add up the numbers, and maybe you’ll win one signed book from each author in my team. This is INTERNATIONAL! But play fast: this contest (and all the exclusive bonus material) will only be online for 72 hours! This begins 10/3 at noon Pacific Time. There are 3 contests going on, and you can enter one or all! I am a part of the GOLD TEAM–but there are also blue and red teams for a chance to win a whole different set of signed books! More info is here: YA Scavenger Hunt homepage. But if you know what you’re doing, jump down. Directions: Below, you’ll find my favorite number. Collect these from all the gold team authors and add them. Hi! 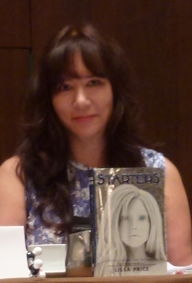 Welcome to my site, I’m Lissa Price, author of STARTERS. Come back and have a look around later. Today, I am so happy to be hosting the lovely Colleen Houck on my website for the YA Scavenger Hunt. 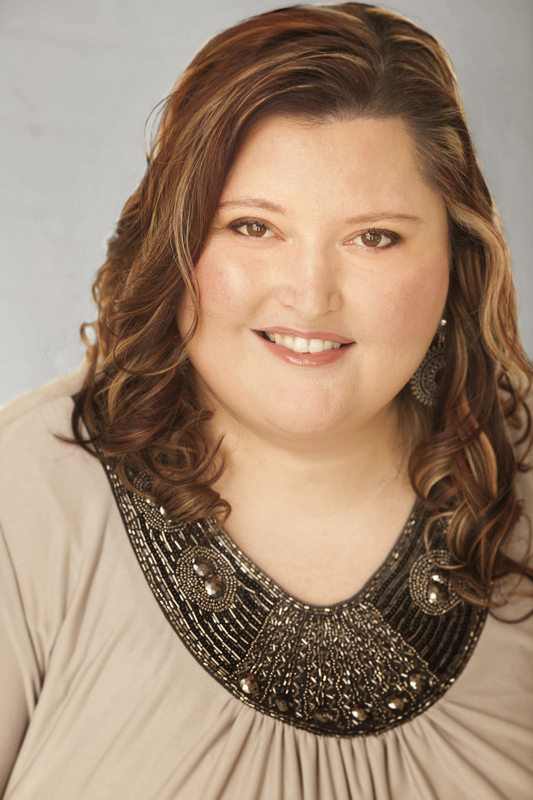 Not only is she a NYT bestselling author, but she’s also the creator of YASH! The last thing Kelsey Hayes thought she’d be doing this summer was trying to break a 300-year-old Indian curse. With a mysterious white tiger named Ren. Halfway around the world. But that’s exactly what happened. Face-to-face with dark forces, spellbinding magic, and mystical worlds where nothing is what it seems, Kelsey risks everything to piece together an ancient prophecy that could break the curse forever. Tiger’s Curse is the exciting first volume in an epic fantasy-romance that will leave you breathless and yearning for more. 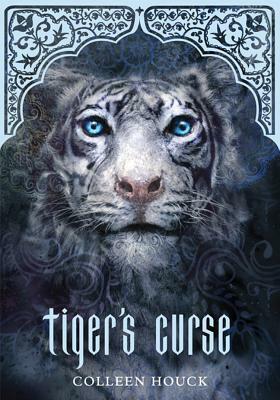 You can purchase Tiger’s Curse here. For this scavenger hunt I am excited to give you not one but two deleted chapters from Tiger’s Voyage which is book three in the tiger series. Both of these chapters are from Lokesh’s perspective and they were cut because we felt it disrupted the flow a bit. Jumping into Lokesh’s head is a little startling when all of my readers are used to the goings on in Kelsey’s mind but getting into the brain of my evil villain was actually very interesting for me. Most of the chapter entitled “Pirates” (originally chapter 18) was reworked into the book but the chapter called “Hunches” (originally chapter twelve) was taken out completely. Enjoy! Don’t forget to fill out the rafflecopter form on my website for a chance to win some fabulous prizes! Happy hunting! Exclusive material deleted at end of YASH. To win the YASH contest, you need to know that my favorite number is 88. Add up all the favorite numbers of the authors on the GOLD team and you’ll have all the secret code to enter for the grand prize! 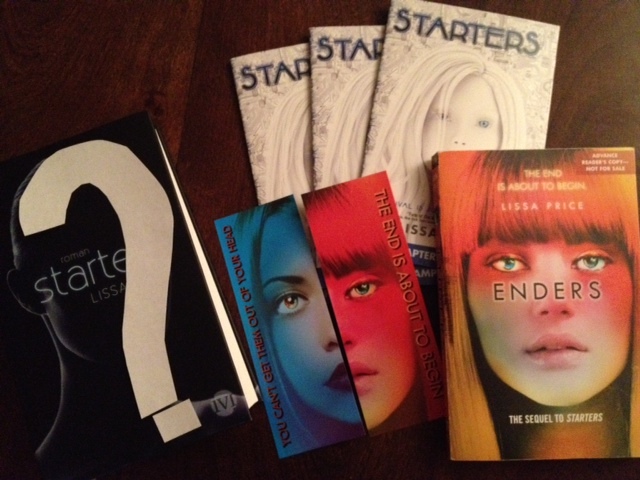 Separate from the YASH contest, you can enter this bonus contest to win an ARC of ENDERS! My publisher only printed a small number of these advanced reader’s copies mainly for newspaper reviewers and booksellers, but I managed to snag one for this special giveaway. If you win, it will be inscribed to you. The winner may have to make promises in blood, but to read this months before it comes out is worth it, right? I’m going to add the new paperback of STARTERS in case you don’t have it. Plus, the paperback has an exclusive short story available nowhere else: “Portrait of a Spore,” which gives insight into the Spore Wars. Second place winner will get a book that I pick (after consulting with you) from either the paperback of Starters or if you have that, one of the various foreign editions of Starters. Third-Fifth place winners will get a chapter sampler and the new bookmarks, signed. US only for all the above however I decided to do something for the international readers, so if you win I’ll arrange a prize. Thanks for following me and playing. Best of luck! Thanks to the fabulous duo of Colleen Houck and Beth Revis for all the work they’ve done organizing this awesome contest. The next stop on the hunt is the exciting debut author, and my blog sister, Mindy McGinnis! Thank you for participating in #YASH. I’m looking forward to reading your books! Thank you so much for being part of this awesome contest!! Thanks Lissa for being part of YASH again. I loved Starters (I have a copy on my bookshelf now) and can’t wait to read Enders! I like the covers! Thanks for the giveaway! Thanks so much for this Awesomesauce giveaway!!!!!!! YOU ROCK!!!! This contest is awesome! I can’t wait to get my hands on Enders! Thanks for the giveaway and great content! waiting for Enders is torture. I’m so excited to read this! AWESOME GIVEAWAY! thanks for being a part of YASH! BTW LOVED Starters!!!!!! I wound love to read Enders early. Also pumped that I follow you on GoodReads or else I don’t think I would have heard about YASH. Thank you so much for being apart of this and for the extra giveaway! I love so much this Book!! Thanks for participating! I love YASH. And I followed on TUMBLR as Redheaded Bookworm! Yes, I heard yesterday from my agent it will publish in January. Some of the fans are saying Feb, but I heard Jan. <333 Brazil! Thank you for considering us international peeps! And yes, Starters is in the bestsellers list here in the Philippines! I already follow you on Twitter and have liked you on Facebook a long time ago. Hee. Hi Lissa! thanks for the giveaway 😀 I’m following on tumblr (jen7waters)! Hello! I read your book starters, about two years ago, and i was soo excited for the next one, i didn’t realise it would be another year! I absooulutly can’t wait for enders! I cant wait for enders to come out. I’m so happy that the Hunt is three times a year AND that this time there are SIXTY authors!!!! Maybe next time there’ll be even more…? I loved Starters, I can’t wait to continue the story with Enders. I’m dying by waiting~ come fast to Brazil, please! I absolutely loved Starters! 🙂 I’ve been waiting forever to read Enders! My birthday is October 9th so it would be an awesome birthday present! I loved Starters and REALLY hope I win! Thanks for the giveaway! So excited for ENDERS!!!!! I don’t have a facebook or tumbler, so I’m sticking to a good old fasioned comment. Love your books! Hi Lissa! When’s the release of Enders? I’m so excited!!!! Hi! Let me ask you, what country are you in? Dates are different for different countries and I don’t know all the release dates, but I’ll try. When is the release for USA? Thanks so much for being involved in this hunt! I am a big fan and love hearing the latest updates!!! Thanks for the great giveaway! I look forward to reading more of your work! I really really want Enders! Can’t wait. Hi! Gorgeous swag 😉 Thank you for putting so many prizes our there. I’m an international reader, I follow on twitter and facebook as @BabelT and Babel Td. And also by email. Cheers. Thanks for the amazing giveaway. I’m an international scavenger just so you know. I’m so excited for Enders it sound so good. Thanks for the awesome giveaway and for participating, Lissa! I loved Starters! And I’m so unbelievably excited for Enders! I can’t wait! 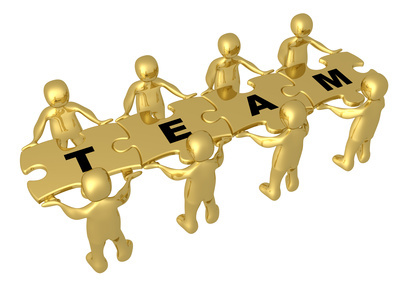 Commenting…Thanks for being part of the #YASH! Thank you so much for the giveaway and I really enjoyed reading Starters! I can’t wait to finish the series! Been dying to read your books! Heard so so many good things about Starters! Fingers crossed! I haven’t read Starters yet, but I’m dying to! Yay! YA Scavenger Hunt is on! Thank you for participating in this! There’s a lot of awesome authors and books up for grabs! Woohoo!! Thanks for the giveaway and I can’t wait to finally read Enders! Thanks for the great giveaway! And thanks for being apart of the YA Scavenger Hunt!! Thanks for the chance to win! I haven’t read Starters yet, but it sounds interesting. I forgot to mention I signed up for the newsletter. This is a great giveaway! My friend read Starters this summer and she loved it. She was telling me all about it and has recommended that I read it. I’m looking forward to doing that whenever I can get it! I loved reading Starters and my students love it as well. I can’t seem to keep in on the shelves. I just ordered another one last week! Thank you for the great giveaway! My friend loves Starters and has recommended I read it. Thanks for being part of the YASH, Lissa, & for hosting an extra giveaway as well! Love the YASH!! Thanks for the chance to win! Thank you for participating in the YASH and for the awesome bonus giveaway! Thank you for participating in #YASH. 🙂 and for the International Giveaway! Thank you so much for this giveaway and being in the YASH! I LOVED Starters! Thank you so much for the bonus giveaway! I feel like I’ve been waiting forever for Enders! I AM SO EXCITED FOR ENDERS!!!! And I am crossing my fingers and toes that I somehow manage to win! Thanks for participating in YASH!!!! And I loved reading the chapters from Colleen Houck!! SO MUCH FUN!! THANK YOU!!! Thanks for hosting this giveaway! Starters has been on my tbr list for a while and I’m excited to read it! So excited for this! Hopefully I can read the book a couple months early, being the selfish book addict I am. Thanks for the giveaway, and being part of this. I was curious do you do interviews for bloggers? So excited! I read through Starters all in one night, and I’ve been waiting for Enders so long!